Rising damp is a common cause of dampness in homes, and functions by way of groundwater moving into the structure via capillary action. This can occur in any wall that is in contact with the ground, and it will continue to become damp as the moisture rises up. As you might expect, this can lead to a number of problems, both in terms of damage to your home and health risks. Firstly, it will affect the appearance of your walls, causing paint to flake or wallpaper to peel, in addition to tidemark effects. There could also be wood rot in skirting boards and timber floors, which may require replacement. Rising damp also carries salts into the walls and plaster, causing damage that will require the plaster to be removed and replaced with specialist damp proofing materials. The growth of mould is a big concern when problems with dampness occur, and the main indicator of mould is the visible spots that will appear on the walls. It is believed that mould may be responsible for allergic reactions in some people and could even play a part in numerous respiratory illnesses. Dust mites may become more common as a result of the increased humidity. The increase in allergens is particularly problematic if you or a member of your family suffer from asthma. Symptoms of these allergic reactions can include itchy eyes, sneezing, a stuffy nose, and other respiratory problems. Most forms of masonry used in buildings will allow water movement by capillary action, although this is typically controlled by a physical damp proof course. In many older properties, however, such features are absent, and in other cases the system may have been damaged, making it possible for rising damp to occur. While it may be tempting to look for a quick fix solution, or even ignore the problem altogether, it is important to take any occurrence of rising damp seriously. There is no way to fix this problem overnight. 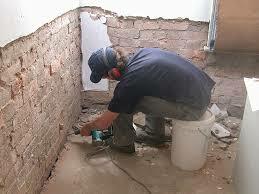 Remedial damp proofing work will be required, which may include the installation of a chemical damp proof course. A wide range of damp proofing products can be found online, which will ensure that the problem does not return.